The next product I'm showcasing from Sasha's Fine Food is their gorgeous Mt. Cook Alpine New Sealand Salmon Pieces which come in a pack of 250g. They are skinless and boneless thus very convenient and easy to cook. Sasha's salmon are imported from Mt. Cook Alphine, New Zealand where they are raised in pristine, fast-flowing fresh glacial waters making them fit, healthy and lean. In terms of taste and texture, the salmon is in fact sashimi-grade and has a firm, muscular texture with a clean, smooth flavour. And like the chicken which I have tried, the freshwater salmon is also free from hormones, antibiotics, vaccines and pesticides. I cook salmon dishes at least once or twice a week as my son is crazy over salmon. 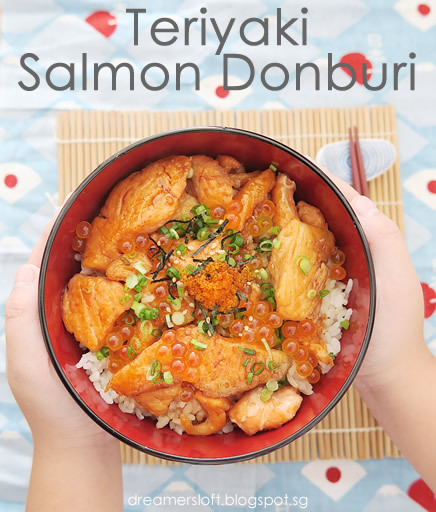 One of his favourite dish is Teriyaki Salmon, so I decided to go for a Donburi using half of the portion. I don't really have a specific recipe this time. Basically, sprinkle the salmon pieces with some salt and pepper, coat with corn starch and pan-fry till browned and crispy, set aside. I usually make my own teriyaki sauce to taste, using soy sauce, mirin, cooking sake and sugar. Bring the sauce to boil and slightly thickened, reserve half for the rice and toss the pan-fried salmon into the remaining sauce. 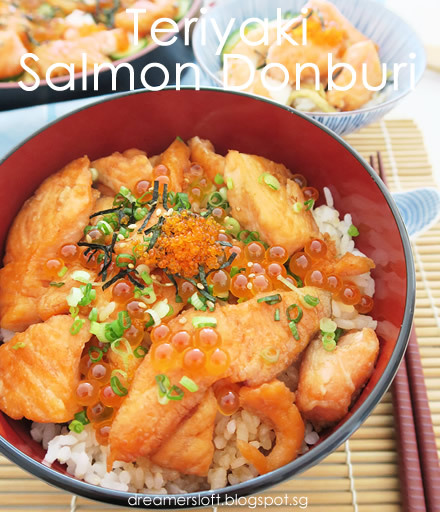 In a bowl, add Japanese rice, drizzle with some teriyaki sauce, then top with the teriyaki salmon, ikura (salmon roe), tobiko (flying fish roe), chopped spring onion and seaweed. Easy peasy and a meal that would make my son very happy! For the other half portion of the salmon pieces, I chose to make Chirashi Sushi with them. Chirashi Sushi (ちらし寿司) is also called Gomoku Sushi (五目寿司), Gomoku Chirashi (五目ちらし), or Bara Sushi (ばら寿司) depending on the different regions in Japan. Chirashi (散らし) means “scattered”, some finely chopped ingredients are mixed into sushi rice and then the rice is topped with more ingredients to make it look colourful. Usually cooked ingredients like unagi and shrimp are used (rather than raw fish), as well as some shredded egg, vegetables like snow peas, cucumber. 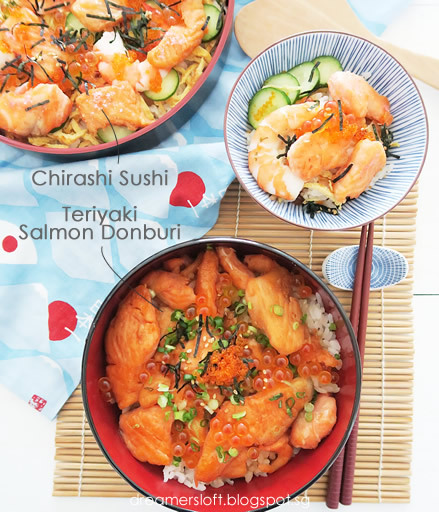 As a tradition in Japan, Chirashi Sushi is usually eaten on Hinamatsuri (雛祭り) or Doll’s Festival on March 3 every year. In addition, it's also a popular dish for parties, gatherings and celebrations. 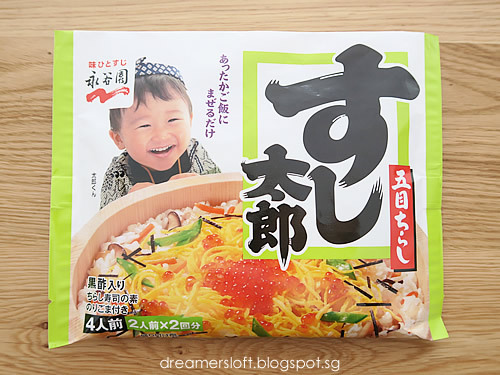 The first time I ate it was during a homestay programme in Osaka where my host family made it for me, and the second time (also the last time) was a gathering for homestay participants at the end of the programme. I haven't eat this for a long time! 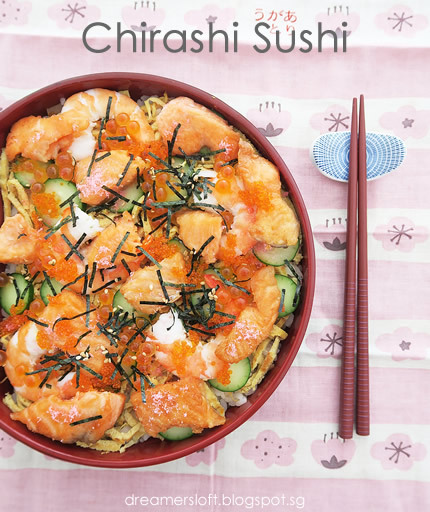 For detail ingredients and method of making Chirashi Sushi, my go-to reference is Just One Cookbook. But for ease of preparation, I bought this Gomoku premix from a Japanese supermarket. All I have to do, is to cook the Japanese rice and mix the premix (sweet vinegar sauce, bits of mushroom, carrot, bamboo shoots, dried gourd shavings) into the cooked rice to get a flavourful sweet and tangy sushi rice. Then just top the sushi rice with desired ingredients; I used pan-fried salmon, cooked shrimp, shredded omelette, cucumber, ikura, tobiko and sprinkle with seaweed and sesame seeds. Chirashi Sushi is typically served in a special type of sushi bowl called Hangiri (or Sushi Oke) which is a big wooden tub, but I couldn't find it so I just used a normal Japanese lacquer serving plate. Stay tune as I continue cooking dishes with the pork slices and cod fillet from Sasha's Fine Food.